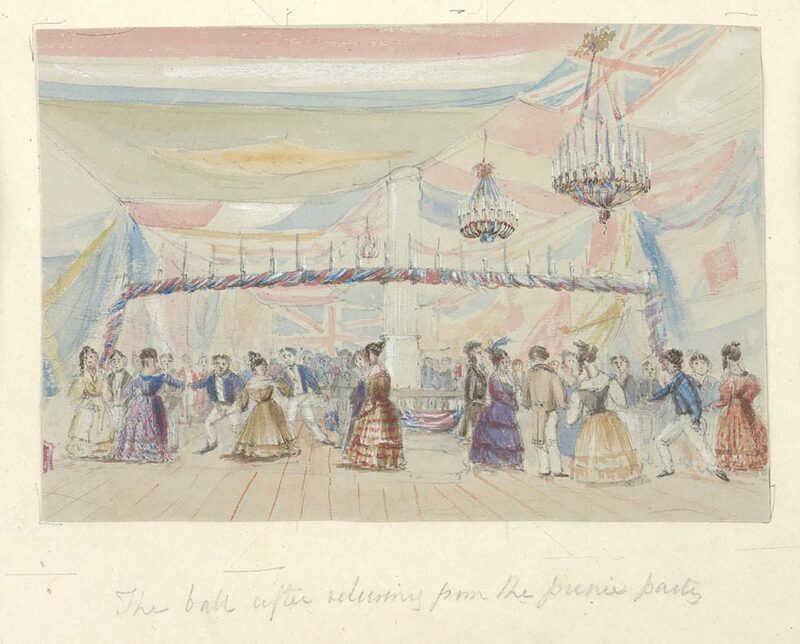 The naïve watercolour records a large group of people – some taking part in the dancing while others gather together to engage in ballroom conversation. Of the people clustered in the foreground, three members of the ship’s company wear white trousers and short blue jackets characteristic of naval apparel, while several male guests wear tail coats of varying shades of brown; all are shown in social interaction with female guests, many arrayed in brightly coloured and/or patterned gowns typical of late 1840s sartorial taste; interestingly, most still wear their hair in side ringlets and topknots more consistent with early 1840s modes. At this time fashionable detail was mainly concentrated on the skirt which had become progressively more decorated, with a preference for double skirts and flounces especially with scalloped edges. A host of shot silk fabrics had appeared on the market – colours shot with black being the most in vogue – with a marked taste for printed muslins and materials with horizontal stripes, as well as striped and checked (plaids) taffetas. Examples of all these textiles these can be seen in this painting. Several of the dresses also exhibit slightly bell-shaped full sleeves and some show the new ‘waistcoat’ corsage. The fullness of the skirt would continue to increase throughout the 1840s, especially for summer weight cottons and silks; the urge to increase the size of the lower half of the costume was only delayed by the practical difficulty of how to keep the skirt properly distended – a problem which would not be alleviated until the invention of the crinoline in the early 1850s. Amateur on-the-spot artworks like this are invaluable for their idiosyncratic detail and observations that professional artists would most likely edit out in preference for more sophisticated composition and rendering techniques. This is one of the many sketches compiled by naval officer Owen Stanley (1811-1850) while in command of the survey ship H.M.S. Rattlesnake, a 28 gun frigate of the Royal Navy. Stanley had developed his talent as a draughtsman and watercolourist during his twenties, serving on board on the Adventure where there was a regular school of artists including the commander P.P. King. His topographical watercolour albums are a valuable record of early Australia, providing a comprehensive and personal record of the antipodes and its inhabitants, confirming Stanley’s lively interest in the people and places he visited. Stanley was given command of the surveying ship, Rattlesnake, in 1846 and ordered from England to conduct an extensive marine survey of the Great Barrier Reef and New Guinea waters, taking with him naturalists John MacGillivray (1821-1867) and Thomas Henry Huxley (1825-1895). The Rattlesnake arrived at Sydney on 16 July 1847, where Thomas Huxley met and later became engaged to Henrietta Heathorn; the couple were subsequently married in England in 1855. PLEASURE PARTY- On Saturday, Captain Stanley and the officers of H.M.S. Rattlesnake invited a large number of friends to a party of pleasure. The guests assembled on board the ship about twelve o’clock [midday] and shortly afterwards proceeded in boats to Camp Cove, where a splendid repast had been prepared, of which all partook with an appetite sharpened by the pull down the harbour. After rambling about and enjoying the scenery for a short time; they returned to the Rattlesnake, the deck of which had in the meantime been converted, by a tasty arrangement of the flags, into a ballroom, in which dancing was kept up until near twelve o’clock [midnight] when the party broke up, all declaring that they were indebted to their gallant hosts for a most delightful day’s amusement. The ship’s initial stay in Sydney was protracted to a period of nearly three months. Finally, during the fall and winter, 1847-1848, the frigate conducted its cruise to make the Inner Passage off north-eastern Australia safe for British shipping. From April, 1848 to February 1849, the expedition continued its hydrographic explorations of the Inner Passage to New Guinea. On April 29 1848, the Rattlesnake again departed from Sydney, for a voyage to the Barrier Reef, reaching its home base Rockingham Bay in the spring of 1848. On 13 March 1850, at the age of 38, Owen Stanley died suddenly aboard the Rattlesnake in Sydney Harbour, of an illness contracted while surveying the Louisiade Archipelago. The ship returned to England in November 1850.